Have you ever sat around thinking about your craft and wishing there was a tool that would meet your needs, but figuring that your dreams of such a thing could never come true? I frequently look at the vast numbers of decorative molds available and think, “That’s lovely, but I’d probably only use it once and it’s so expensive. Plus I only do cakes for donation most of the time so I can’t cost justify a whole set of fancy molds, nor those silicone mold-making kits.” So I’ve often thought how cool it’d be to have some kind of re-castable medium that’s also food safe. I’ve even tried playing with things like the wax that comes on Baby Bel cheese, frozen buttercream (which does work okay for gummy), and various contraptions made from foil and/or cling wrap. Nothing worked well for casting fine detail, especially from smaller objects. It just so happened that I’d just received my Kickstarter mega box load of plastic RPG minis from Reaper, so I decided those would make excellent test subjects. I had no doubt based on the videos that Composi-Mold would do well with large objects, but how would it do with very fine details? 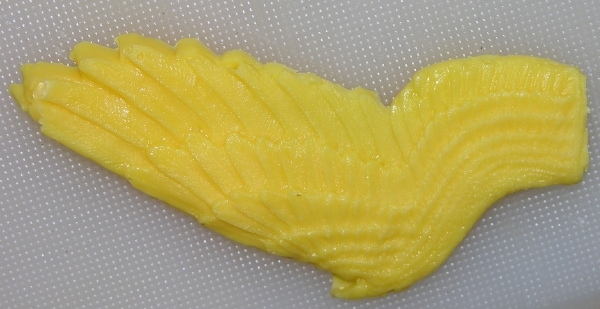 I watched Composi-Mold’s video on making two-part molds and set about doing that with one of the wings from the Reaper Griffon since it seemed like two-sided wings might be a reasonable thing to want for a cake decorating project. 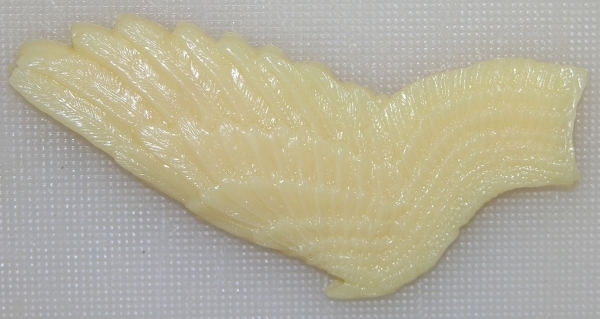 It was big and flat so easy from that perspective but would challenge the mold on detail of all of those feathers and would push the limit when casting because of being thin. I figured if this worked, it’d be instant proof that bigger stuff would also work. 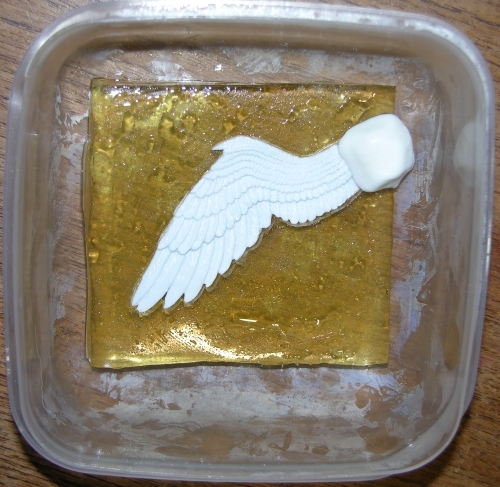 At first I decided to see if it’d work to do a more standard two piece mold than they showed, so I tried filling a container with some melted Composi-Mold and laid the wing on top of it. I was pretty sure it’d float, especially with that much surface area. I let that set up hard and cold in the fridge, then froze it for about ten minutes, applied cooking spray to the whole thing, and poured the top half of the mold on. This is about where I realized I’d forgotten to add some excess fondant or something to form a sprue hole into which the casting media could be poured. Whoops. Clearly there were reasons why their video said to do it differently. But at least this reusable material means I didn’t blow money on a mistake like this! I just pushed Satin Ice into the still-lightly-greased mold as I would any other push mold and it came out with great detail. Here’s that one-sided wing trimmed of excess. That’s a perfectly serviceable piece for many cake decorating applications. The residual cooking spray gets absorbed into the fondant in a few hours so don’t worry about cleaning it off. 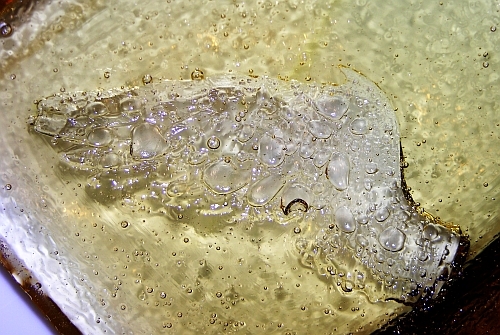 If you tap it lightly as you pour, the bubbles come up and away from the item you’re casting. 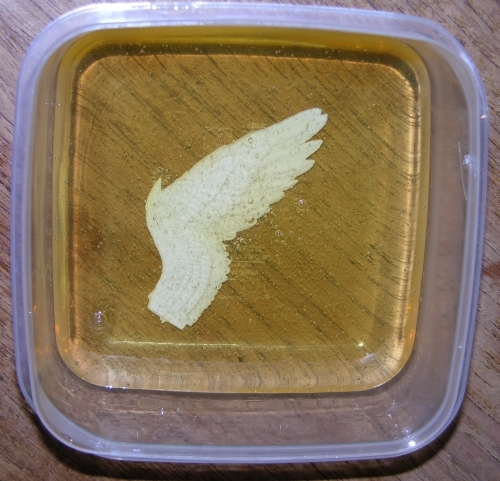 Here’s that mold solidified. You can now see the fondant I used to stick it to the bottom. Some Composi-Mold got underneath but that’s fine because you just trim that away with an x-acto knife. Here is the same thing as the photo above but with the excess trimmed away and the fondant removed. 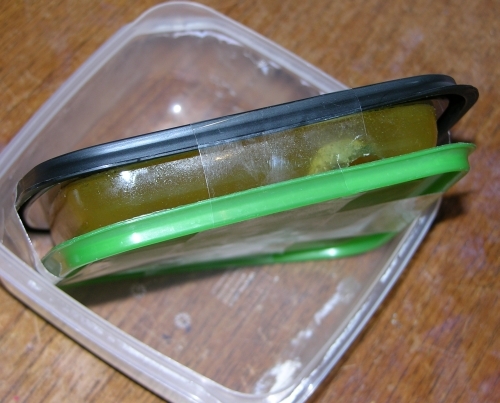 I also trimmed the sides with scissors so it’d fit back into the container easily. This time I remembered to add a bit of fondant on the side as a sprue/filling hole! I also sprayed the whole thing again with cooking spray as a release. Success! Once it had all set up, I was able to separate the mold along three edges by running my finger down the seam and leave the fourth slightly attached so the whole thing opened like a stiff book. I also used my x-acto blade to widen the sprue/pour hole a bit, but other than that it looks like I got this mold right! 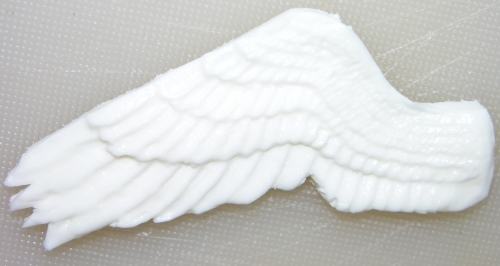 Press-molded fondant wing, side 1. 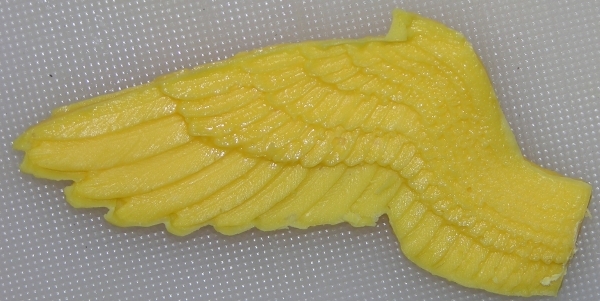 Press-molded fondant wing, side 2. I trimmed that wing and set it aside to firm up, and later put it on a flower former curve to let it dry solid with a bit of a curve to it. Meanwhile I sandwiched the mold between two flat plastic tub lids and taped it together tightly with packing tape to hold it firmly shut. I positioned it in a tub mostly upright. I foolishly put some of the packing tape in the way of the pour hole, but then cut it away with my x-acto blade. I happened to have some Opaque Gummy around from a separate experiment (which I’ll post about later), but any of my gummy recipes should work just fine and as always the translucency could be used to fantastic effect. 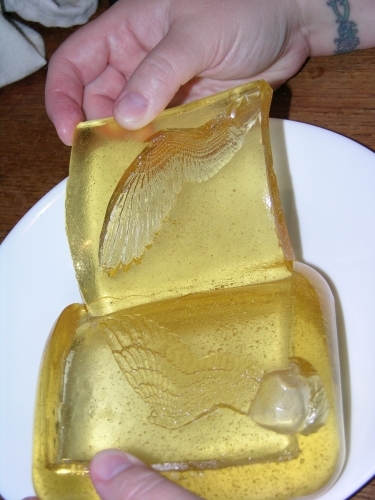 I warmed the gummy up and then let it cool to just before solid and also put the mold in the fridge. That way I’d lessen any chance of hot gummy melting the mold. And therein lies the only fault Composi-Mold has compared to silicone molds: I very much doubt you can cast hot sugar or Isomalt with Composi-Mold because the working temperatures with those media will likely exceed the melting point of Composi-Mold. 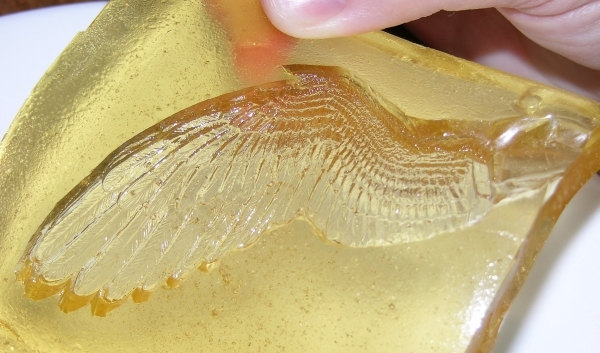 Think of Composi-Mold in the same light as chocolate molds, not hard candy ones. Anyway, when the mold was cold and the gummy was liquid but not very hot, I used my standard baster technique to pour it into the mold. Voila! Another success! 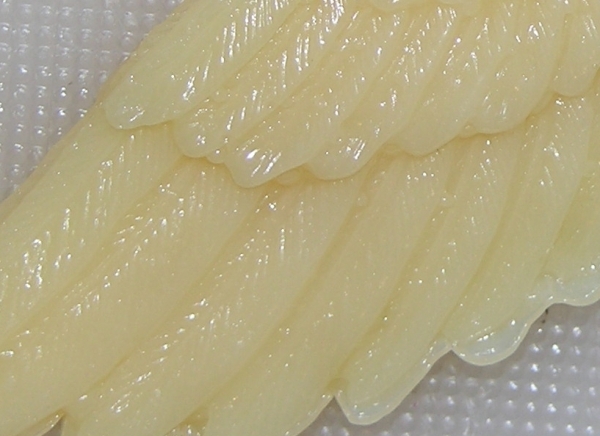 Detail from side 1, showing how well the mold translated the original plastic feather lines to the end product. 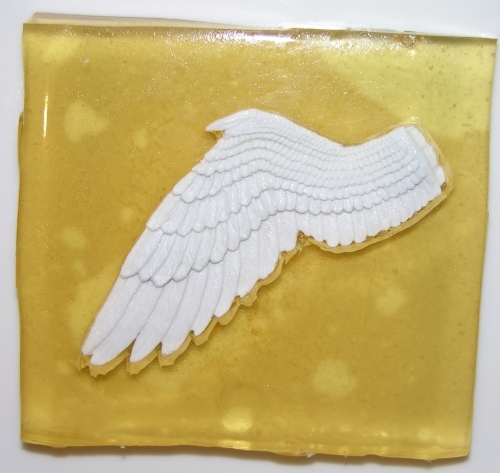 Wilton candy melt wing, side 1. Some edge cleaning is required but an x-acto takes care of that easily. Obviously you could use lots of colours of candy melts or chocolate to spectacular effects. 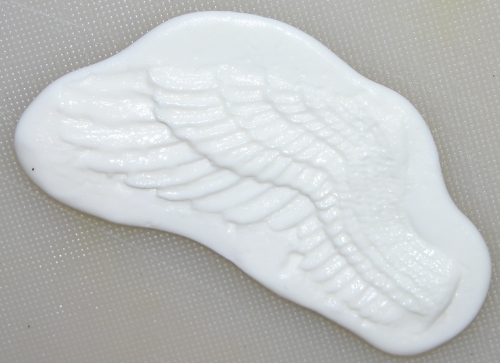 Wilton candy melt wing, side 2. 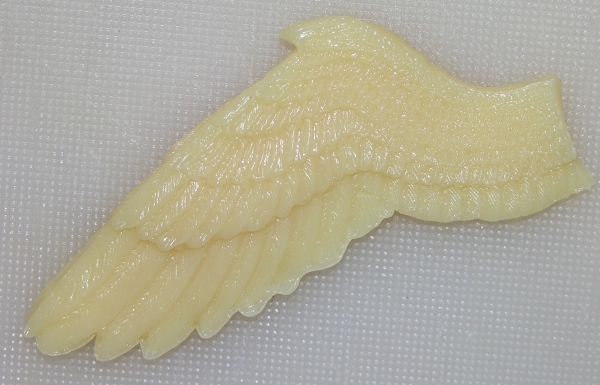 From top to bottom: the original plastic wing, half of the two-piece mold, the one-sided wing with gel colours added on one side, the two-sided wing dried in a curve, the Opaque Gummy wing, and the Wilton Candy Melt wing. 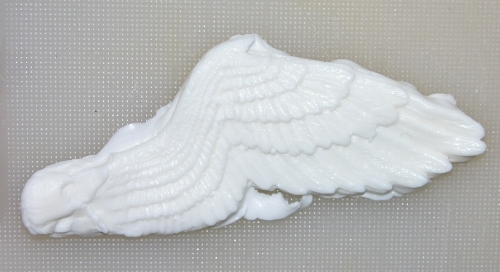 Clearly, Composi-Mold is fantastic at capturing fine detail and works very well in a variety of edible media. I was wholly impressed by this experiment. There was just no way I was going to get that tiny shovel handle out intact in soft fondant. Even pushing hard on the outside of this thick mold couldn’t get the fondant between the legs very well. This figure is too small for fondant. Anyway, I decided to give the mini concept another try, but this time found one that had a wide base with a skirt. As you can see from the photo below, my first attempt with the gummy solidified before making its way to the bottom of the mold. For the second attempt, I made the gummy thinner (which makes it much more delicate and hard to get out intact) and used the baster to really shove it down in, but even then it trapped bubbles in the arms and unlike with the urethane in the video linked above, there was no time to squeeze bubbles out before the gummy solidified. So once again I tried shoving fondant into it, but even this broom hand and arm kept breaking off on removal from the mold because fondant just can’t go that small without serious fragility issues. 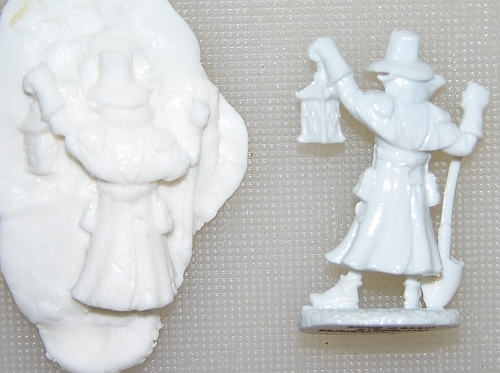 The original plastic one on the left is 1.25″ / 3.5 cm tall, so this is super-small scale stuff. 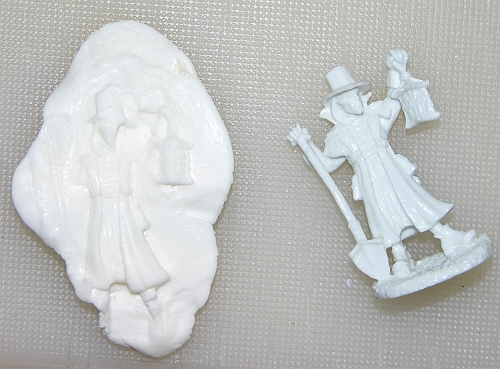 It’s possible if you found a mini with the right shape and did proper mold-casting along seam lines you could replicate it in edible media, but at this scale it’s very difficult to work with in general. 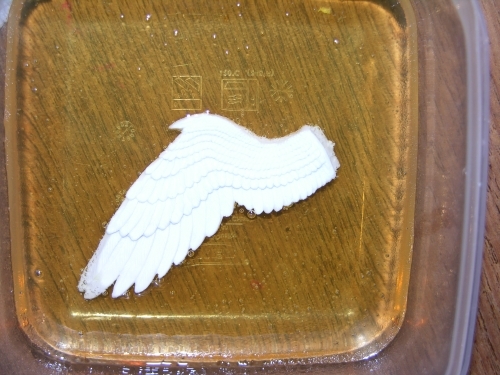 Again, that’s the edible media that’s tricky: the Composi-Mold picked up the detail and worked just fine. 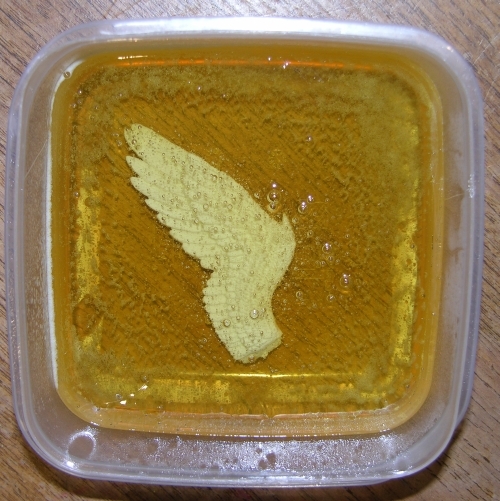 Summed up: Composi-Mold is a convenient, reusable mold medium that picks up excellent detail from original pieces and translates it well to all kinds of media, including edible ones. 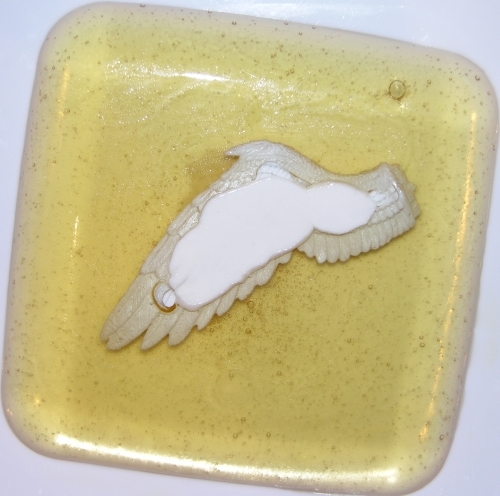 The limitations I found were more the fault of the edible media than the Composi-Mold. It is rare for me to be this enthusiastic about a product, but it really does fill my personal need to be able to have on-the-fly molds for cake decorating without purchasing tons of expensive silicone molds. I will be eagerly demonstrating and recommending Composi-Mold to the Capital Confectioners Cake Club in August, and I know there will be a bunch of dropped jaws followed by applause. I will also send this review out to everyone I love in the cake world, because I know this is something a lot of people have been wishing for! I am so impressed with this product that I’ve even agreed to place an affiliate link on the sidebar of this blog, which otherwise doesn’t accept advertising. I will get 10% of sales from that link but honestly I’d post their link even without that because I heartily recommend it. Composi-Mold rocks. Get some and make things on your cakes that nobody else has ever made before! UPDATE: This post is actually referring to Composi-Mold FC, their Food Contact version. There is also Composi-Mold LT which is the original version not meant to be used for food. If you are purchasing some for food, be sure to stick to the FC stuff. This entry was posted in Experimental Techniques, Gummy, Products, Severe Nerdery. Bookmark the permalink. oh my, these moulds are absolutely fantastic!